Do you have a day that you cheat? On your diet, not your partner! 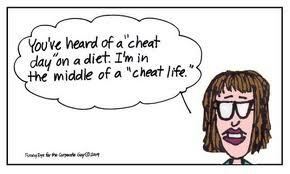 Some people never cheat and others cheat regularly like one day on and one day off. When I was dedicated to the No White Food Diet, I would take Fridays off. Not over-the-moon bingeing but I would allow pizza crusts and a wee bit of alcohol. Now, on the No White Food Diet, hard liquor has no carbs, the mix does, unless you’re a Jameson Woman (real women drink whisky and/or whiskey not “girls”). But a nice cider or glass of wine was a “cheat”. Yesterday was my cheat day. I got weighed and Norm and I both saw the doctor. Dr. Fretz is our whole family’s doctor so she knows us very well. Norm now has to watch what he eats. Less fats and salt. Hmmm, I guess he’ll have to eat MY menu now. But after the pre-op appointment, I met Leanne at the MyChosin Cafe and had me a wonderful brunch, which worked itself into breakfast, afternoon snack and breakfast this morning. I had no guilt about it by 12 noon today. Yesterday I felt like the world’s biggest cheat. Now I’m craving Tim Horton’s. I would love an Espresso IceCap. That’s an icy, blended cappuccino with an extra shot of decent espresso. I can almost taste it. And, since we have a drive through and if I’m going to Tim Horton’s, a crueller would be the icing on the cake – literally. Hmm. I think I will dodge this bullet, the “Friday cheat trigger” I mean. I will go have coffee with Nansi. Just coffee! Those who know me better will keep very quiet, the day is not over yet. ~ by 1fatgirlshrinking - Diane Kirby on June 1, 2012.